The only Central Coast community in British Columbia with a highway link to the rest of Canada, Bella Coola sits at the end of Highway 20 West. It also sits at the west end of the 'Freedom Highway'. 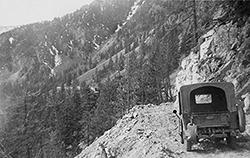 The Freedom Highway was so named to commemorate Bella Coola's inclusion with the rest of British Columbia by road - or by two ruts - as most described it. The government refused to help build an overland route from Bella Coola to Anahim Lake where Highway 20 continued to Williams Lake. Locals got together with $250, dynamite, equipment and two years of sheer determination and backbreaking work to build a road up the rock face of mountains in the Coast Range. 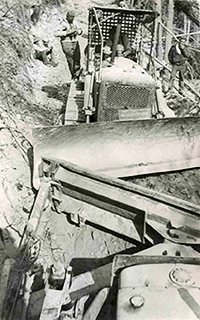 On September 26, 1953, the catskinner from Bella Coola touched the blade of his cat to that of the cat driver moving the last of the boulders out of the way from Anahim Lake above. It still took 10 hours to drive the 90 miles from the port of Bella Coola to Anahim Lake but it was enough to convince the government that it could be done, and they took over road improvements in 1955. It is still an 'interesting' drive and the steepest highway in Canada with an 18% grade. 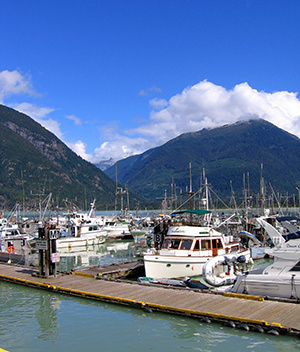 Bella Coola is the terminus of the Discovery Coast Ferry Service, has its own airport and is a major supply area for delivery of goods and services to the largest community within the Central Coast. The townsite of about 10 00 people offers amenities such as lodging, groceries and fuel. 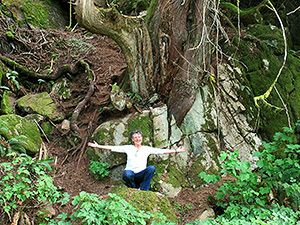 The Bella Coola Valley is surrounded by steep mountains and loaded with walking trails. It is also the jumping off point for ocean fishing for halibut, salmon, prawns and crab should you wish to charter a boat out of the harbour. There is a large Marina just west of the Bella Coola townsite and just east of Clayton Falls where Bella Coola generates a large majority of its electricity and where you can find a lovely picnic site and trails. 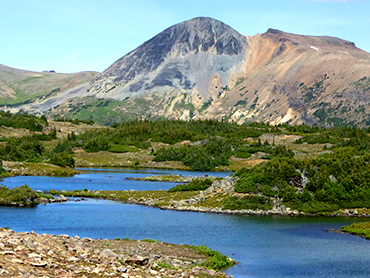 This is also the road that will take you to Blue Jay, Grey Jay and M.Gurr Lakes, wonderful hikes that will garner stunning views of the alpine lakes and the North and South Bentinck Arms that lead in from the Pacific Ocean. 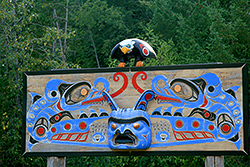 Nearby, the Nuxalk Community is carrying on a tradition of cultural heritage that includes its extremely rich and complex ceremonialism surrounding potlaches and other social events. They hold their language and totems sacred and have a flourishing carving and arts scene where each piece is individually handcrafted and tied to family crests and a shared ancestral history. 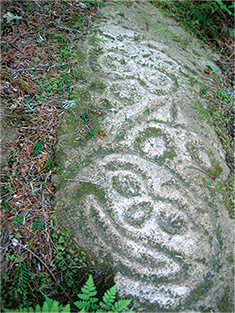 The Nuxalk also consider themselves to be the guardians of ancient petroglyphs in the forest considered to be over 4000 year old. They provide two hour tours that begin at the Copper Sun Gallery, located at 442 Mackenzie Street in Bella Coola. On the way to the townsite itself, you will go through several small communities that also offer various amenities. Hagensborg is the next largest community in the Valley and is just east of Bella Coola on Highway 20. There's a large grocery store there that can supply pretty much allof your grocery and sundry needs. The entire valley is surrounded on both sides by magnificently treed mountains sporting beautiful waterfalls. 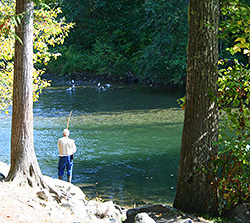 Along the way, you might wish to stop at the Fisheries campground along the Atnarko River, and try your hand at Salmon fishing. There are several excellent hiking trails in the area and for those who would just like a short day hike, there's the Kettle Pond and Burnt Bridge trails. 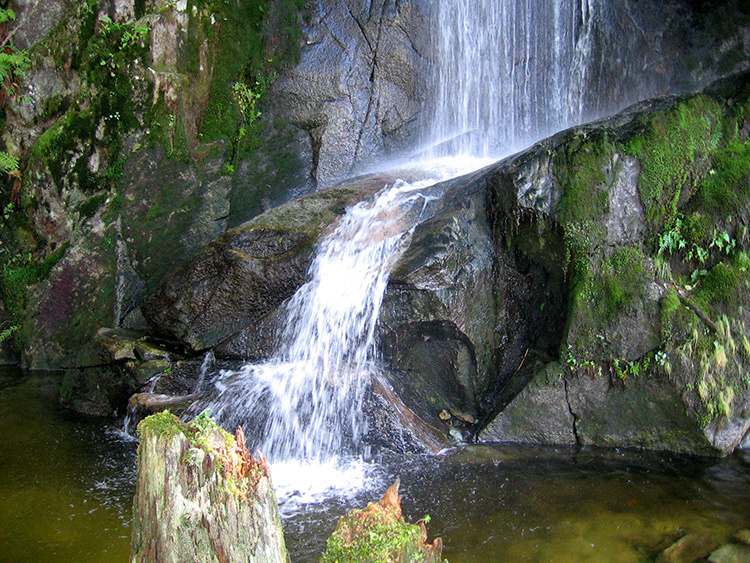 If you would like a long overnight hike, try the Hunlen Falls Trail. Hunlen Falls is named for the Indian Trapper, Hana-Lin and is the third highest free falling water fall in Canada at over 1000 feet. It is at the northern end of the Turner Lake chain and can be reached by flying in from Nimpo Lake or hiking 10 miles on the Hunlen/Atnarko River Trail. It starts at the bottom of the Bella Coola hill at the Atnarko 'tote' road and climbs over 6000 feet. 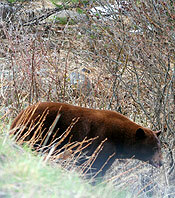 Care is suggested as there are a lot of resident grizzly bears in the area. Bella Coola provides a mysterious green solitude and its jungle-like Coastal vegetation is a far cry from the arid Chilcotin Plateau. Tweedsmuir Park - Make sure to bring your camera with you into the park, as it isn't at all unusual to have Black Bear, Grizzly and deer cross your path as you drive down the highway. There is also a bear viewing station inside the park overlooking the Atnarko River soon after you reach the bottom of the 'Hill'. If you would like more information on trails in the Bella Coola Valley and surrounding mountains, there are a number of sources. The Bella Coola Trail Alliance has an online source at bellacoolatrails.ca and while it doesn't list all the trails in the area, it's a good start. The 101 Things to do Along Highway 20 guide has some great information and you can find the online link here. This is also a great source to find out about the Discovery Coast Circle Tour! Since Bella Coola has the ferry terminus many people like to take a circle drive when on vacation in the area. You can follow the highways from Vancouver, through Williams Lake onto Highway 20 west, right through the Chilcotin, down into the Bella Coola Valley and pick up a ferry down the coast back to Port Hardy on Vancouver Island which will eventually take you back over to Vancouver. Or do it in reverse. It just doesn't get any better than that! For more information on the Bella Coola Valley and surrounding area, check out Bella Coola's own visitor site at bellacoola.ca.